Transcription by RNA polymerase II requires assembly of a preinitiation complex (PIC) composed of general transcription factors (GTFs) bound at the promoter. In vitro, some GTFs are essential for transcription, whereas others are not required under certain conditions. PICs are stable in the absence of nucleotide triphosphates, and subsets of GTFs can form partial PICs. By depleting individual GTFs in yeast cells, we show that all GTFs are essential for TBP binding and transcription, suggesting that partial PICs do not exist at appreciable levels in vivo. Depletion of FACT, a histone chaperone that travels with elongating Pol II, strongly reduces PIC formation and transcription. In contrast, TBP-associated factors (TAFs) contribute to transcription of most genes, but TAF-independent transcription occurs at substantial levels, preferentially at promoters containing TATA elements. PICs are absent in cells deprived of uracil, and presumably UTP, suggesting that transcriptionally inactive PICs are removed from promoters in vivo. Transcription by RNA polymerase (Pol) II requires assembly of a preinitiation complex (PIC) composed of general transcription factors (GTFs) bound at the core promoter (Conaway and Conaway, 1993; Buratowski, 1994; Orphanides et al., 1996; Roeder, 1996). However, despite considerable work over the past three decades, it remains unclear which GTFs are absolutely required for PIC formation and Pol II transcription. GTFs were defined originally as factors necessary and sufficient for ‘basal’ transcription from core promoters in vitro. However, such in vitro reactions varied with respect to the promoter used, the concentration and purity of GTFs, and the concentration and nature (e.g. supercoiled, circular, or linear) of the DNA template. Aside from Pol II itself, GTFs include the TATA-binding protein (TBP), TFIIA, TFIIB, TFIIE, TFIIF, and TFIIH. Under some conditions, removal (to the extent possible) of any one factor from the complete reaction causes a drastic reduction in transcriptional activity. However, TFIIA is dispensable or only mildly stimulatory under other conditions (Ozer et al., 1994; Sun et al., 1994; Yokomori et al., 1994). TFIIE, TFIIF, and TFIIH can be dispensable or only stimulatory for transcription from negatively-supercoiled templates, depending on the promoter (Parvin and Sharp, 1993; Goodrich and Tjian, 1994; Parvin et al., 1994; Timmers, 1994). TBP-independent transcription that requires only YY1, TFIIB, and Pol II has been observed on supercoiled templates with the YYI initiation element (Usheva and Shenk, 1994). In addition to the classically defined GTFs, TBP-associated factors (TAFs) in the TFIID complex and the Mediator complex are important or required for Pol II transcription in vitro, depending on the promoter and conditions (Tjian and Maniatis, 1994; Takagi and Kornberg, 2006). In vitro, the PIC is a stable entity that initiates transcription upon addition of nucleotide triphosphates (Conaway and Conaway, 1993; Buratowski, 1994; Orphanides et al., 1996; Roeder, 1996). PIC assembly is initiated with the binding of TBP (or the TFIID complex) to the promoter, as none of the other factors can stably bind DNA on their own (Buratowski et al., 1989). GTFs can be sequentially added to give a series of stable, ‘partial PICs’ prior to assembly of a transcriptionally active PIC (Buratowski et al., 1989). Such partial PICs are highly informative on the nature of the interactions between GTFs and the promoter, and structures of functional PICs have now been determined at the atomic level (Sainsbury et al., 2015; Robinson et al., 2016; Hantsche and Cramer, 2017). Functional PICs can vary with respect to the presence or absence of TAFs, Mediator, and TFIIA. In vivo studies of the role of GTFs for PIC formation and transcription are incomplete. In addition, the requirement for every GTF to permit cell growth makes it impossible to completely eliminate GTF function/activity and to exclude the possibility of indirect effects. Depletion studies indicate that TBP, TFIIB, and Pol II are essential for transcription (Moqtaderi et al., 1996; Fan et al., 2010; Wong et al., 2014), whereas TFIIA is important but not essential (Chou et al., 1999; Liu et al., 1999; Stargell et al., 2000). The kinase subunit of TFIIH (Kin28) is important for promoter escape and Mediator dissociation, but considerable transcription occurs upon its depletion or inactivation (Jeronimo and Robert, 2014; Wong et al., 2014). Depletion of the entire Mediator complex abolishes Pol II transcription, but Mediator sub-modules can support transcription, albeit at lower levels than the wild-type strain, and can inhibit promoter escape (Petrenko et al., 2017). Depletion of Taf1 has led to conflicting results. Most studies indicate a selective role at TATA-less promoters (Moqtaderi et al., 1996; Kuras et al., 2000; Li et al., 2002), whereas others suggest a general requirement for Pol II transcription (Warfield et al., 2017). The relative occupancies of GTFs at promoters are consistent across all promoters (Kuras et al., 2000; Pokholok et al., 2002; Rhee and Pugh, 2012), strongly suggesting that a structurally similar PIC mediates a given level of transcription. Mediator occupancy at core promoters is transient, due to Kin28-dependent dissociation, but it is strongly correlated with GTF occupancies upon Kin28 depletion (Jeronimo and Robert, 2014; Wong et al., 2014). Nevertheless, while Mediator stimulates PIC formation, it is not an obligate component of the PIC in vivo (Petrenko et al., 2017). TAF occupancy does not strictly correlate with GTF occupancy, providing strong evidence that transcription can be mediated by TAF-containing (i.e. TFIID) and TAF-lacking forms of transcriptionally active TBP, with the relative usage of these two forms depending on the promoter (Kuras et al., 2000; Li et al., 2000). Depending on which TBP form predominates, promoters can be classified roughly as either 1) constitutive, TATA-lacking, and TFIID-dependent or 2) inducible, TATA-containing, TFIID-independent, and SAGA-dependent (Struhl, 1986; Chen and Struhl, 1988; Struhl, 1987; Iyer and Struhl, 1995; Moqtaderi et al., 1996; Basehoar et al., 2004; Huisinga and Pugh, 2004). A variety of other experiments strongly support the idea of functionally distinct forms of TBP. First, the TFIID form is specifically recruited by the Rap1-containing activator and associated NuA4 histone acetylase complex to promoters of ribosomal protein genes (Li et al., 2002; Mencía et al., 2002; Uprety et al., 2012; Uprety et al., 2015). In contrast, many other activators do not directly recruit TFIID (Kuras et al., 2000; Li et al., 2000) but rather recruit the SAGA histone acetylase complex (Bhaumik and Green, 2001; Bhaumik et al., 2004). Second, TBP is preferentially retained at the TAF-containing vs TAF-lacking promoters upon thermal inactivation of TFIIB or Mediator (Li et al., 2000). Third, the relative use of TFIID- vs. SAGA-dependent mechanisms at a given promoter can differ depending on the environmental conditions (Ferdoush et al., 2018). However, this view has been challenged by experiments claiming that the two classes of promoters behave similarly upon TFIID depletion (Warfield et al., 2017). Here, we perform a comprehensive analysis of GTF function in vivo by using the anchor-away technique (Haruki et al., 2008) to individually deplete each GTF from the nucleus. We demonstrate that all classically defined GTFs are required for PIC formation/stability and Pol II transcription in vivo, suggesting that PICs contain all GTFs. In apparent contrast to some previous observations (Li et al., 2000; Zanton and Pugh, 2006), our results suggest that partial PICs are unlikely to be stable in vivo. In contrast, while TAFs contribute to Pol II transcriptional activity at most (and perhaps all) genes, we provide direct evidence that TAF-independent transcription occurs at a substantial level. Lastly, we discover that PICs are not observed in cells depleted for uracil, suggesting a mechanism that removes transcriptionally inactive PICs from promoters. Our findings lead to a revised view of the preinitiation complex in vivo. To systematically study the role of GTFs and Pol II on transcription, we constructed anchor-away strains for subunits of TBP (Spt15), TFIIA (Toa1 and Toa2), TFIIB (Sua7), TFIIE (Tfa1 and Tfa2), TFIIF (Tfg1), TFIIH (Ssl1 and Ssl2), and Pol II (Rpb1). In the absence of rapamycin, growth of these strains is comparable to that of an untagged parental strain (Figure 1A), indicating that the fusion of the FRB domain to the targeted factors does not significantly affect their function. In contrast, when these proteins are removed from the nucleus by treatment with rapamycin, these strains fail to grow (Figure 1A), as expected from the essential roles of GTFs. Binding of the targeted GTFs at active promoters (PMA1 and CCW12) is reduced to background or near-background levels after rapamycin treatment for 1 hr (Figure 1B), indicating that depletion of GTFs is highly effective. Conditional depletion of GTFs causes severe growth and transcriptional defects. (A) Growth of the indicated anchor-away cells (5-fold serial dilutions) in the presence or absence of rapamycin. (B) Occupancy of the indicated FRB-tagged GTFs at the PMA1 and CCW12 promoters in the corresponding strains and an untagged control strain in the presence of absence of rapamycin. (C) Pol II occupancy at the CCW12 and RPS14B coding regions in the indicated strains grown in the presence or absence of rapamycin. Error bars represent the standard error of at least three independent experiments. To examine the effect of depleting individual GTFs on Pol II transcription, we first measured Pol II occupancy at the coding regions of several well-expressed genes. While the addition of rapamycin has minimal effects on transcription in an untagged parental control strain, Pol II occupancy at coding regions of all genes tested is reduced to very low levels upon depletion of any GTF (Figure 1C and Figure 1—figure supplement 1). To extend these results to genome scale, we performed Pol II ChIP-seq analysis on the same samples to which a known amount of S. pombe chromatin was added as an internal control for immunoprecipitation and data normalization. In all cases, depletion of any GTF drastically reduced transcription to near-background levels as determined by metagene (Figure 2A) or individual gene (Figure 2B) analyses. In contrast, as will be discussed later, depletion of Taf1 results in a modest decrease in transcription. Furthermore, upon TBP depletion, TBP and Pol II occupancies decrease in a kinetically similar manner (Figure 2C), indicating that loss of TBP results in an immediate cessation of transcriptional initiation. All GTFs are generally required for ongoing Pol II transcription. (A) Mean Pol II occupancy averaged over 453 well-transcribed genes (metagene analysis) in strains depleted (+rap) for the indicated factor and in the parental (WT) strain (±rap). Partial reduction is observed only for the TAF1-depleted strain. (B) Pol II occupancy at individual genes (the same set of 453 genes ordered from top to bottom by expression level in WT) in strains depleted for the indicated factor. For each gene, the log2 change in Pol II occupancy after depletion is indicated according to the red/blue scale. (C) TBP and Pol II occupancies at the indicated promoters in the TBP-depletion strain at various times after rapamycin treatment. Error bars represent the standard error of at least three independent experiments. In the above experiments, genes are expressed at steady-state levels prior to depletion of the GTF. To address the effect of GTF depletion on inducible transcription, we first depleted cells of an individual GTF and then analyzed the rapid transcriptional activation response to heat shock. 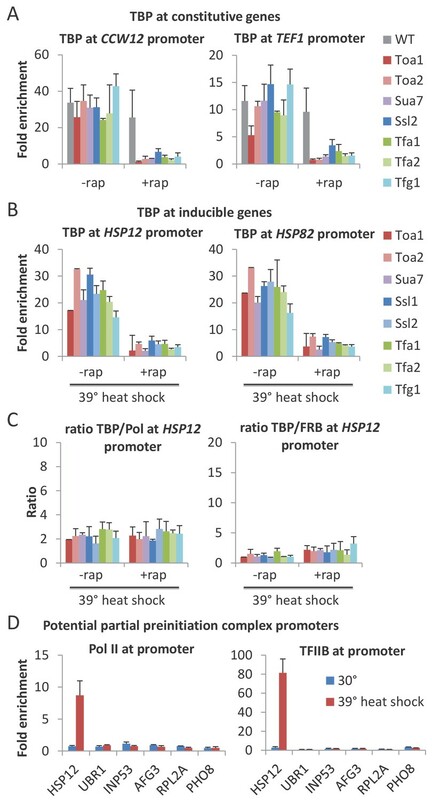 In accord with drastic transcriptional effects described on non-inducible genes, induction of HSP12 (Figure 3A) and other heat shock genes (Figure 3—figure supplement 1A) is very strongly decreased, although not completely eliminated, for all GTFs (but not Taf1). All GTFs are required for transcriptional induction upon heat shock. (A) Mean Pol II occupancy at the HSP12 coding region (ORF) and promoter in strains depleted (or not) for the indicated factor and then induced for 15 min by shifting to 39°C. (B) FRB-tagged GTF:Pol II occupancy ratio at the induced HSP12 promoter in cells pretreated or not with rapamycin to deplete the indicated factors. The residual levels of transcription observed upon GTF depletion could reflect GTF-independent transcription or, more simply, incomplete depletion of the GTF. In this regard, the anchor-away system works somewhat less efficiently in stress conditions (Petrenko et al., 2017). As discussed and shown elsewhere for TBP (Petrenko et al., 2017), incomplete depletion of an essential GTF will reduce (but not eliminate) transcription and its occupancy at the promoter, but it will not affect the nature of the PIC and hence the GTF:Pol II occupancy ratio. Indeed, the GTF:Pol II occupancy ratios for all cases of GTF depletion are comparable to that observed prior to depletion (Figure 3B and Figure 3—figure supplement 1B). Thus, the residual levels of transcription are due to incomplete depletion, indicating that all GTFs are required for Pol II transcription in vivo. As GTFs are components of the PIC, it is expected that their essential role in Pol II transcription reflects their requirement for a functional PIC. However, as partial PICs lacking various GTFs are stable in vitro (Buratowski et al., 1989), it is unclear whether such partial PICs are stable in vivo. To address this issue, we examined the effect of GTF depletion on PIC levels by measuring TBP occupancy at the promoter. For all GTFs, TBP occupancy levels at both continually expressed (Figure 4A and Figure 4—figure supplement 1A) and heat-shock inducible (Figure 4B and Figure 4—figure supplement 1B) genes are drastically reduced upon depletion. In addition, the TBP:Pol II and TBP:GTF occupancy ratios for all cases of GTF depletion are comparable to that observed prior to depletion and in the parental strain (Figure 4C and Figure 4—figure supplement 1C). Thus, each GTF is required for a stable PIC in vivo. As TBP is the only GTF that can independently and stably bind to DNA (Buratowski et al., 1989), these results indicate that, unlike the situation in vitro, partial PICs containing GTF subsets are very unstable in vivo. All GTFs are required for TBP occupancy, and hence PIC stability/formation. (A) TBP occupancy at the CCW12 and TEF1 promoters in strains depleted (+rap) or not (-rap) for the indicated factor. (B) TBP occupancy at the HSP12 and HSP82 promoters in strains depleted (+rap) or not (-rap) for the indicated factor and subject to a heat shock. (C) TBP:Pol II and TBP:FRB-tagged GTF occupancy ratios at the induced HSP12 promoter in cells pretreated or not with rapamycin to deplete the indicated factors. (D) Pol II and TFIIB occupancies at the indicated promoters previously reported to have partial PICs (Zanton and Pugh, 2006) under normal (blue) and heat shock induction (red). Our results are in apparent contrast to a previous report claiming the existence of partial PICs in response to a mild heat shock (37°C) based on altered GTF:GTF occupancy ratios (Zanton and Pugh, 2006). However, in that report, the altered occupancy ratios for the vast majority of the genes with apparent partial PICs are very modest. To address this more directly, we measured the TFIIB and Pol II occupancies at several genes including those analyzed by Zanton and Pugh (2006). We did not observe increased TFIIB:Pol II occupancy ratios in response to heat shock (39°C) at any of these genes (Figure 4D). Thus, our results suggest that partial PICs do not exist at appreciable levels in vivo, although their existence cannot be completely excluded. In vitro, the PIC is extremely stable in the absence of nucleotide triphosphates, and indeed is defined by its ability to initiate transcription upon addition of these precursors. We attempted to mimic this situation in vivo by analyzing PIC levels and transcription under conditions in which ura3 mutant cells were starved of uracil. As removal of uracil from the medium does not immediately eliminate intracellular uracil (because ura3 cells require and hence contain uracil for growth prior to the removal), we examined TBP and Pol II occupancy levels at various times after removal of uracil (Figure 5 and Figure 5—figure supplement 1A–C). As uracil depletion causes metabolic mayhem (Brauer et al., 2008), we examined genes that are typically inhibited (Figure 5A and Figure 5—figure supplement 1B), induced (Figure 5B and Figure 5—figure supplement 1C), or unaffected (Figure 5C) by metabolic stress. A general loss of PICs in cells depleted for uracil. (A) Pol II (ORF and promoter) and TBP occupancies at promoters (PMA1 and RPL28) of genes inhibited by metabolic stress in cells depleted for uracil or leucine for various times (color scale). (B) Similar analysis for HSP82, a gene induced by various metabolic stresses. (C) Similar analysis for genes TDH2, YRA1, and ACT1, genes unchanged upon metabolic stress. (D) Average TBP/Pol II ratio at all tested promoters at various times after depletion of leucine (blue) or uracil (red). See Figure 5—figure supplement 1D for individual tested promoters. Upon removal of uracil from the medium, cells grow at near-normal rates for about 2 hr (using up the intracellular uracil) and then show decreased growth with cessation at about 4 hr (Figure 5—figure supplement 1A). With the exception of heat shock genes, TBP and Pol II occupancies at all promoters tested decrease over time, and PIC and transcription (Pol II occupancy at coding regions) levels are extremely low after 4 hr. Interestingly, the average TBP:Pol II occupancy ratio near the promoter decreases at intermediate times (15–60 min) of uracil depletion (Figure 5D and Figure 5—figure supplement 1D), as would be expected from Pol II buildup caused by reduced elongation due to decreased (but non-zero) UTP levels. At the heat shock genes, TBP and Pol II occupancies sharply increase at early times, presumably due to the stress response to uracil depletion, but they drop to virtually undetectable levels after 2–4 hr. In addition, TBP occupancy at Pol III and Pol I promoters is also extremely low upon uracil depletion. The drastic drop in PIC levels upon uracil removal is unlikely to be due to growth arrest per se, because depletion of Kin28 (Wong et al., 2014) or Taf1 (see below) only modestly reduces TBP and Pol II occupancy, even though cell growth is blocked. To address whether PIC instability is due to metabolic limitation per se, we performed a similar experiment depleting cells of leucine (the strain is also a leu2 auxotroph). Leucine-depleted cells show a similar growth pattern as uracil-depleted cells with growth cessation at 4 hr. In contrast to the uracil-depleted cells, leucine-depleted cells do not show a drop in TBP and Pol II occupancy at all genes, although growth-inhibited genes are affected (Figure 5A–C, Figure 5—figure supplement 1). In addition, leucine-depleted cells do not show early induction of PIC levels at heat shock genes, presumably because they do not undergo the same stress response, nor do they show increased Pol II:TBP ratios at intermediate times of leucine depletion (Figure 5D and Figure 5—figure supplement 1D). The differences between uracil- and leucine-depleted cells are consistent with transcriptional profiling experiments in auxotrophic cells grown in chemostats at various concentrations of the required metabolites (Brauer et al., 2008). Thus, our results suggest that the drastic and general drop in PIC levels upon uracil removal is due to the absence of UTP precursors. As depletion of uracil, and consequently UTP, blocks transcriptional elongation, we considered the possibility that other factors involved in the elongation process might also affect PIC levels. We therefore analyzed PIC levels and transcription upon depletion of FACT, a histone chaperone complex that travels with elongating Pol II in vivo (Mason and Struhl, 2003) and is important for elongation through chromatin templates in vitro (Orphanides et al., 1998). FACT does not directly associate with promoters, but rather associates (directly or indirectly) with the elongation machinery after Pol II escapes from the promoter (Mason and Struhl, 2003). In accord with previous results (Pathak et al., 2018), depletion of FACT strongly reduces Pol II occupancy throughout the genome (Figure 6). 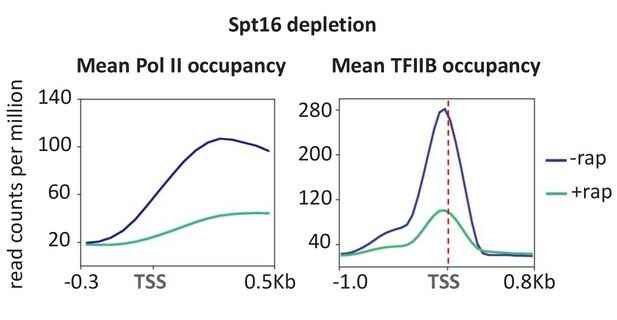 More interestingly, TFIIB occupancy at essentially all promoters is reduced to a comparable extent, indicating that FACT is important for PIC formation or stability. As FACT is not a component of the PIC, these observations suggest that some aspect of FACT-dependent elongation is important for PIC levels. As such, these observations are consistent with the drastic decrease in PIC levels upon uracil depletion, but the mechanism by which FACT affects PIC levels is unknown. Depletion of Spt16 subunit of FACT reduces transcription and PIC formation. Mean Pol II occupancy and TFIIB occupancy averaged over 453 well-transcribed genes and promoters before and after Spt16 depletion. The role of TFIID is controversial with respect to whether it is selectively (Moqtaderi et al., 1996; Kuras et al., 2000; Li et al., 2000; Basehoar et al., 2004) or generally (Warfield et al., 2017) required for transcription. Genome-scale analysis of Pol II occupancy in TAF1-depleted cells grown in SC medium reveals an overall ~2 fold decreased in transcription (Figure 2A,B). Furthermore, transcription is significantly more affected at TATA-lacking vs. TATA-containing genes as observed by metagene (Figure 7A) or individual gene analyses (Figure 7B). Taf1 depletion selectively affects TFIID-dependent genes. (A) Mean Pol II occupancy averaged over 453 well-transcribed ‘SAGA’ or ‘TFIID’ genes in parental or Taf1-depleted strains. (B) Pol II (C) TBP, TFIIB, and TFIIA, and (D) Taf1 occupancies at ‘SAGA’ (PMA1 and CCW12) or ‘TFIID’ (ACT1, TEF1, RPL28, RPS14B) coding regions in the Taf1-depletion strain treated or untreated with rapamycin. (E) TBP:TAF1 occupancy ratios in the Taf1-depletion strain treated or untreated with rapamycin. (F) Log2 change in Pol II occupancy (measured at +200–400 from the TSS) for the indicated gene classes upon Taf1 depletion. ‘Active’ genes are the top 10% of transcribed genes, broken up into ‘SAGA’ and ‘TFIID’-dependent categories. Ribosomes include only the ribosomal genes from the TFIID-dependent category. ‘TFIID active, no ribosomes’ are the remainder of the top 10% transcribed genes in the TFIID-dependent category after ribosomal genes have been removed. ‘All’ genes are the entire set of ~5000 s. cerevisiae genes, broken up into ‘SAGA’ and ‘TFIID’-dependent categories. 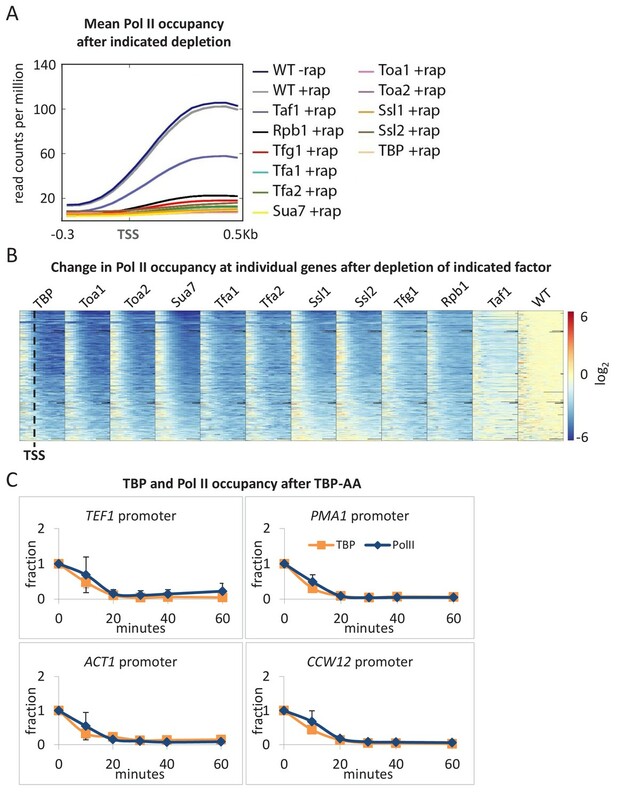 To exclude the possibility that these modest transcriptional effects are due to incomplete TAF1 depletion, we analyzed TBP, TFIIA, TFIIB (Figure 7C) and Taf1 (Figure 7D) occupancies at several promoters. Importantly, when Taf1 is depleted and no longer detected, TBP, TFIIA, and TFIIB strongly associate with promoters, but the effects depend on whether the promoter is ‘SAGA- or TFIID-dependent’. At ‘SAGA-dependent’ promoters (PMA1, CCW12), Taf1 levels are low, and Taf1 depletion has marginal effects on GTF occupancy. As a consequence, the TBP:Taf1 occupancy ratio at these promoters are far above those occurring in non-depleted cells (Figure 7E). In contrast, at ‘TFIID-dependent’ promoters with relatively high levels of Taf1 occupancy (RPL28 and RPS14B), GTF occupancy decreases upon Taf1 depletion, and the TBP:Taf1 occupancy ratio is only slightly affected (Figure 7E). In contrast and as shown above (Figure 2C), depletion of any individual GTF does not significantly alter the GTF:TBP or GTF:Pol II ratio. 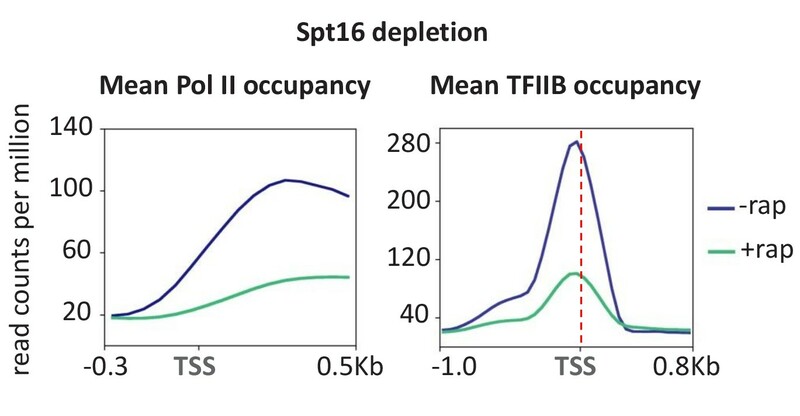 As expected, the TBP:TFIIA and TBP:TFIIB occupancy rations are similar in non-depleted and TAF1-depleted cells (Figure 7—figure supplement 1A). Thus, TAF1 behaves differently than all GTFs and hence is selectively important but not required for Pol II transcription. Our results are in apparent contrast to those of a recent study that claimed that Taf-depletion (via auxin-induced degradation) resulted in ‘similar transcription decreases for genes in the Taf-depleted, Taf-enriched, TATA-containing, and TATA-less gene classes’ (Warfield et al., 2017). However, the conclusion of this other study was based on analysis of all ~5000 yeast genes, most of which are transcribed at low or even background levels that prevent accurate measurements. We performed a similar analysis of all ~5000 genes using the Taf1-depletion data presented here and confirmed a very modest difference between SAGA and TFIID-dependent promoters (Figure 7F; see ‘all SAGA’ and ‘all TFIID’). Our analysis involves Pol II occupancy between +200 to+400 from the transcription start site, which avoids complications between transcriptional initiation and elongation. Although (Warfield et al., 2017) analyzed the region between 0 and +100, analysis of our Taf1-depletion data in this region also shows that the distinction between ‘all SAGA’ and ‘all TFIID’ genes is virtually non-existent (Figure 7—figure supplement 1B). When we restrict the analysis to more actively transcribed genes, for which Pol II occupancy levels are well above the background (i.e. the top 453 as shown in Figure 2A,B and Figure 7A), the distinction between ‘active’ SAGA and TFIID genes is clear (Figure 7F). 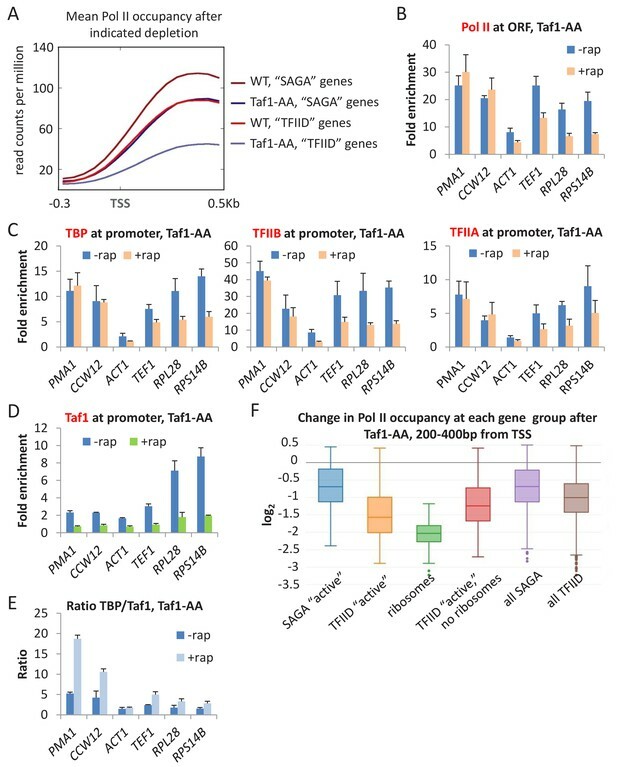 In addition, among TFIID-affected genes, ribosomal protein genes are even more strongly affected by Taf1 depletion (Figure 7F). In accord with this result, analysis of the same set of actively transcribed genes upon auxin-mediated depletion of Taf11 or Taf13- (Warfield et al., 2017) shows a clear distinction between SAGA and TFIID genes (Figure 7—figure supplement 2) and comparable to the Taf1-depletion data presented here. Thus, our experimental results are completely consistent with those of Warfield et al. (2017), and they clearly demonstrate that TFIID-specific Tafs are selectively important for transcription of TATA-less genes. Although GTFs were defined originally as factors required for ‘basal’ transcription in vitro, some GTFs are dispensable or only stimulatory under certain reaction conditions. In vivo, only some GTFs have been examined for their requirement for Pol II transcription, and few of these studies were performed on a whole-genome scale. Here, we show that every GTF is essential for Pol II transcription of essentially all genes. The limited amount of Pol II transcription observed upon GTF depletion is due to incomplete depletion, not GTF-independent transcription. While the basic observation is perhaps to be expected, the discrepancies between the in vitro and in vivo results are noteworthy. For example, TFIIE, TFIIF, and TFIIH are not required for in vitro transcription on negatively supercoiled templates (Parvin and Sharp, 1993; Goodrich and Tjian, 1994; Parvin et al., 1994; Timmers, 1994). While mechanistically interesting for understanding the transcription process, this observation is not relevant under physiological conditions, and it suggests that the DNA template is not negatively supercoiled in vivo. The general requirement for TFIIA is unexpected. Under many in vitro conditions that involve normal DNA templates, TFIIA is stimulatory but not absolutely required (Ozer et al., 1994; Sun et al., 1994; Yokomori et al., 1994). In apparent agreement, multiple studies in vivo concluded that depletion of TFIIA generally reduces, but does not eliminate, transcription (Chou et al., 1999; Liu et al., 1999; Stargell et al., 2000). However, these in vivo experiments had two problems that could not be addressed at the time, because the method of chromatin immunoprecipitation had just started being applied to transcription factors. First, these experiments involved mRNA measurements, which are not a direct assay of transcription, especially given the then unknown fact that transcription and mRNA decay are coupled (Haimovich et al., 2013). Second, there was no way to assess whether the modest transcriptional effects of TFIIA depletion reflected incomplete depletion. By directly analyzing transcription and determining the TFIIA:TBP:Pol II occupancy ratios under TFIIA-depletion conditions, we demonstrate that TFIIA behaves indistinguishably from other GTFs in vivo. This indicates that the ability of TFIIA to stabilize TBP binding to promoters is essential under physiological conditions. Results presented here (see below) and elsewhere (Petrenko et al., 2017) indicate that although TAFs and Mediator contribute to PIC levels at most (and probably all) promoters, they are not essential for PIC formation and hence are not GTFs. In contrast, related studies using auxin-induced degradation to deplete these factors claimed that these factors are essential and hence comparable to GTFs (Warfield et al., 2017). However, our analysis of Warfield et al. (2017) data yield PIC and transcription levels that are comparable to our results using the anchor-away method for depletion of these factors (Figure 7—figure supplement 2A). While we suspect that Warfield et al. (2017) interpreted the reduced PIC and transcription levels as a consequence of incomplete depletion, our direct analyses of factor occupancy here (Figure 7) and elsewhere (Petrenko et al., 2017) clearly indicate that transcriptionally active PICs can exist in the absence of TAFs or Mediator but not GTFs. In vitro, the full complement of GTFs forms a PIC that is very stable in the absence of nucleotide precursors. Moreover, stepwise addition of GTFs results in a series of stable, partial PICs (Buratowski et al., 1989). In contrast, TBP occupancy is drastically reduced upon depletion of any individual GTF, indicating that partial PICs exist at very low levels in vivo. In addition, PICs are virtually non-detectable when cells are depleted of uracil, presumably due to a transcriptionally inactive PIC. Consistent with this, the relative ratios of GTF occupancies are similar on a genome-wide level (Rhee and Pugh, 2012), indicating that PICs are compositionally identical under the condition tested. As such, cells have a mechanism(s) to prevent stable, transcriptionally inactive PICs despite the intrinsic ability of the GTFs to form them. Our conclusion about the instability of partial PICs is in apparent conflict with two previous observations. First, it has been claimed that partial PICs exist at some promoters during a mild heat shock (Zanton and Pugh, 2006). However, our re-analysis of the underlying data as well as direct experimental evidence questions the validity of the claim. Second, TBP can remain at TAF-dependent promoters upon thermal inactivation of TFIIB or the Med17 subunit of Mediator (Li et al., 2000). There are several possible explanations, not mutually exclusive, for this apparent discrepancy. The ts mutants used in these earlier experiments may not (and are unlikely to) completely inactivate TFIIB or Mediator, and promoter occupancy of these factors upon thermal inactivation was not assessed. In addition, as transcription measurements relied on mRNA levels only 45 min after the ts shift, considerable mRNA remained from before the shift (i.e. wasn’t degraded), thereby making it impossible to measure modest levels of transcription. Indeed, more recent experiments using Pol II occupancy as an assay indicate that substantial transcription occurs in the Med17 ts (and anchor-away) strains, and transcription and TBP occupancy is more efficient at TAF-dependent promoters (Petrenko et al., 2017). However, as the Pol II occupancy measurements here are made 1 hr after GTF depletion, we cannot exclude the possibility that metastable partial PICs might exist at earlier time points. In wild-type cells, Mediator is part of the PIC, but it dissociates from the PIC upon TFIIH-dependent phosphorylation of the C-terminal tail of Pol II, thereby permitting rapid promoter escape (Jeronimo and Robert, 2014; Wong et al., 2014). Mediator dissociation from the PIC is rapid (estimated life-time 1/8 s), and it leaves behind a post-escape complex containing GTFs that is capable of re-initiation with a new Pol II molecule (Wong et al., 2014). A Mediator-lacking PIC is competent for transcription in vivo, albeit at a lower level than a wild-type PIC (Petrenko et al., 2017). Thus, the PIC is extremely dynamic, both with respect to Mediator and to the instability of partial PICs. The lack of PICs in uracil-depleted cells does not simply reflect cessation of cell growth or metabolic mayhem, because considerable PIC levels are observed upon depletion of Kin28, TAF1, or leucine, conditions in which cell growth is blocked. The observation that general PIC loss is observed specifically during uracil depletion suggests that the effect is due to the elimination of UTP precursors. In support of this conclusion, the Pol II:TBP occupancy ratio increases at intermediate levels of uracil depletion (intermediate time points), presumably reflecting poor elongation under UTP-limiting conditions. Taken together, these observations strongly suggest that, unlike the situation in vitro, a transcriptionally inactive PIC is unstable in vivo. In principle, UTP limitation could affect PIC formation by leading to degradation, nuclear export, or an inactivating modification of a GTF. Alternatively, it could induce/activate a general inhibitory factor that blocks PIC formation or clears PICs from the promoter. The fact that uracil depletion results in loss of Pol II and Pol III PICs suggests that the ultimate target of the signal might be something in common between these different transcription machineries, such as TBP or the common subunits of the RNA polymerases. Genetic and chromatin immunoprecipitation experiments over the past two decades indicate that the TAF subunits of TFIID are not generally required for transcription in yeast cells, but are selectively important at certain classes of promoters (Struhl, 1986; Chen and Struhl, 1988; Struhl, 1987; Iyer and Struhl, 1995; Moqtaderi et al., 1996; Kuras et al., 2000; Li et al., 2002; Basehoar et al., 2004; Huisinga and Pugh, 2004). However, these conclusions were questioned by a recent study (Warfield et al., 2017). As discussed below, we believe that the results here support the original conclusions about the role of TFIID in yeast cells. As correctly noted (Warfield et al., 2017), early studies of Taf function involved measurements of mRNA levels, which do not necessarily reflect transcriptional activity, especially given the mechanistic connection between mRNA synthesis and mRNA decay (Haimovich et al., 2013). Upon analysis of newly synthesized mRNA, Taf1 depletion (via auxin-mediated proteolysis) in YPD medium caused a general 5-fold reduction in transcription (Warfield et al., 2017). However, Taf1 depletion in SC medium caused only a general 2-fold defect (Warfield et al., 2017), consistent with our results using anchor-away-mediated depletion in SC medium. This difference in Taf1 function in YPD vs. SC medium is reminiscent of the difference in Mediator recruitment by activator proteins under these two conditions. As activator function typically increases in sub-optimal growth conditions (Fan et al., 2006; Fan and Struhl, 2009), we suggest that the reduced activator function in YPD medium makes transcription more dependent on TFIID than SAGA. Importantly, in contrast to the dramatic decrease in transcription upon depletion of any individual GTF, the modest decrease in transcription in Taf1-depleted cells strongly argues against a general, GTF-like requirement for TFIID. The long-standing belief that TFIID is selectively important at different classes of promoters was based on two complementary findings. First, unlike the constant GTF:GTF occupancy ratios at all promoters, the Taf1:GTF ratio is variable, strongly suggesting that there are TAF-containing and TAF-independent forms of transcriptionally active TBP (Kuras et al., 2000; Li et al., 2000). Formally, the different Taf1:GTF ratio could reflect differential crosslinking of TFIID at various promoters. However, our observation that substantial transcription and TBP occupancy occurs when Tafs are virtually absent from the promoter (i.e. a Taf1:TBP occupancy ratio of near zero) directly demonstrates the existence of a functional PIC lacking TAFs. Importantly, in wild-type cells, the Taf1:TBP occupancy ratios vary between 0.2 and 1.0, indicating that TAFs (and hence TFIID) contribute to transcription at all promoters (Kuras et al., 2000)(Figure 7E). Thus, the recent whole-genome analysis showing Taf occupancy at all promoters (Warfield et al., 2017) is consistent with previous results and does not indicate that TFIID is generally required for transcription. Second, genes showing higher relative levels of Tafs (and hence TFIID) show stronger reductions in transcription upon Taf depletion, thereby linking TFIID occupancy with TFIID-transcription. Our whole-genome analysis extends this observation and clearly demonstrates that depletion of TAF1 affects ‘TFIID-dependent’ genes more strongly than ‘SAGA-dependent’ genes. In contrast, (Warfield et al., 2017) reported that Taf depletion does not differentially affect TFIID vs. SAGA genes. In resolving this apparent discrepancy, we note that our analysis was performed on 453 active genes, because Pol II occupancy at less expressed genes is at the detection limit. In contrast, (Warfield et al., 2017) performed their analysis on all genes, and we suspect that the poor signal:noise of the vast majority of genes masked the TFIID vs. SAGA distinction. From all these considerations, we reiterate our long-standing view of TFIID function in yeast cells (Kuras et al., 2000). There are TAF-containing (TFIID) and Taf-lacking forms of transcriptionally active TBP. TFIID associates with promoters and contributes to transcription of all genes, but substantial transcription can occur in the absence of Tafs. The relative usage of the two TBP forms depends on the promoter, and occurs in a continuum. The TFIID form is particularly important at TATA-lacking promoters, reflecting the importance of TAF:DNA contacts in the absence of a canonical TATA element (Verrijzer et al., 1994; Verrijzer et al., 1995; Oelgeschläger, et al., 1996; Burke and Kadonaga, 1997). The Taf-independent form typically requires a canonical TATA element for a stable interaction with TBP. Lastly, it appears that the relative usage of the two forms depends on the growth conditions, possible due to different levels of activator function which is linked to SAGA recruitment. The key feature of this view involves the two different forms of TBP (Taf-containing and Taf-lacking) at the promoter. As both forms typically contribute (to various extents) to transcriptional activity of a given gene, the frequently used terms ‘TFIID-dependent’ and ‘TFIID-independent’ (typically also called ‘SAGA-dependent’) genes are misleading. Furthermore, while TATA elements are less common in ‘TFIID-dependent’ genes as compared to ‘TFIID-independent’ genes, TATA elements are not the sole determinant of the relative usage of the two forms of transcriptional active TBP. In this regard, TFIID is specifically recruited to ribosomal promoters by the RAP1-containing activator associated with the NuA4 histone acetylase co-activator complex (Li et al., 2002; Mencía et al., 2002; Uprety et al., 2012; Uprety et al., 2015). Thus, the mechanistic distinction refers to the differences in the basic transcriptional machinery, not the promoters or genes. The multiple yeast Pol II machineries active at individual promoters are conceptually analogous to the multiple bacterial RNA polymerases that differ by the σ factor bound to the core enzyme and that can act at many individual promoters (Wade et al., 2006). Strains used in this study are listed in Supplementary file 1. 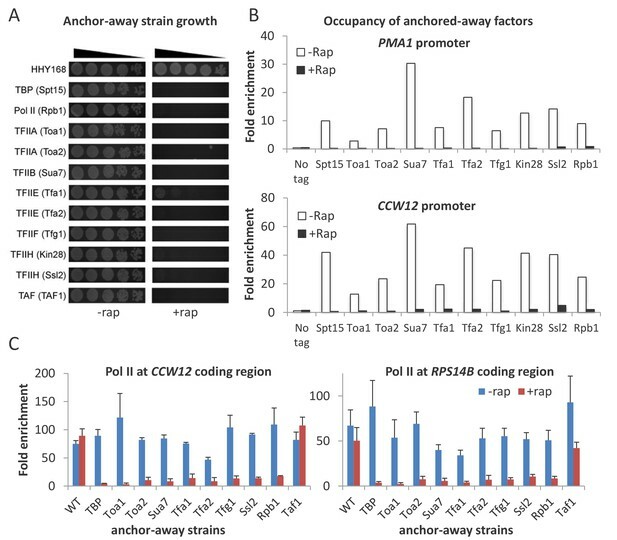 Anchor-away strains were constructed as described previously (Wong et al., 2014). For spotting assays, yeast cells were grown at 30°C to an OD600 of 0.3–0.5, diluted to 0.1, and 5-fold serial dilutions of cells were spotted on plates containing YPD medium with or without 1 μg/ml rapamycin for 48–60 hr. For all other experiments (except for that involving Sp16 depletion, which was performed in YPD medium), strains were grown in SC liquid media to an OD600 of 0.4, and rapamycin was then added to a final concentration of 1 μg/ml for 1 hr except when otherwise indicated. For heat shock experiments, cells (pretreated or not with rapamycin for 45 min) were grown at 30°C, filtered, and then transferred to pre-warmed 39°C medium for 15 min in the presence or absence of rapamycin. For the uracil and leucine depletion experiments, cell grown in SC medium were filtered, washed with appropriate medium, and transferred to SC medium lacking either uracil or leucine for the indicated times. Chromatin, prepared as described previously (Fan et al., 2008) from 5 ml of cells (OD600 ~0.5), was immunoprecipitated with antibodies against Pol II unphosphorylated CTD (8WG16, Covance), FRB (Enzo Life Sciences), Taf1 (a kind gift from Steve Buratowski), TBP, TFIIA, and TFIIB. Immunoprecipitated and input samples were analyzed by quantitative PCR in real time using primers for genomic regions of interest and a control region from chromosome V to generate IP:input ratios for each region. The level of protein association to a given genomic region was expressed as fold-enrichment over the control region. At least three biological replicates (culture samples collected on separate days, with lysis and IP performed on separate days) were performed for each experiment, and each sample was analyzed in triplicate by qPCR (technical replicates) to obtain an average value for that sample. Error bars represent the standard deviation between the biological replicates. Barcoded sequencing libraries from ChIP DNA (two biological replicates per strain) were constructed as described previously (Wong et al., 2013). Sequence reads were mapped using Bowtie available through the Galaxy server (Penn State) with the following options: -n 2, -e 70, -l 28, -v −1, -k 1, -m −1. Normalization was performed relative to S.pombe DNA, added in equal amounts to each sample before immunoprecipitation, for the replicates with spike-in, and relative to the number of mapped reads, as well as the median Pol II levels at a non-transcribed region of Chromosome V set as the ‘background level’ for the replicates without spike-in; similar results were obtained with and without spike-in. ChIP-seq data were visualized using the Integrated Genome Browser. Mean occupancy curves were generated using Galaxy deepTools (Freiburg, Germany), scaled relative to the number of mapped reads and fragment size, and expressed as counts per million mapped reads (CPM). Individual gene analysis for fold Pol II occupancy change was likewise performed using Galaxy deepTools. TFIID- and SAGA-dependent genes were defined previously (Basehoar et al., 2004; Huisinga and Pugh, 2004). Boxplots were generated using Plotly Chart Studio (https://plot.ly/create/box-plot/). The ChIP-sequencing data and associated files are available through the Gene Expression Omnibus (GEO) under the accession number GSE122734. Proceedings of the National Academy of Sciences 85:2691–2695. Annual Review of Biochemistry 62:161–190. Nature Structural & Molecular Biology 13:117–120. Where does mediator bind in vivo? Current Opinion in Structural Biology 47:17–22. Molecular and Cellular Biology 15:7059–7066. Nature Structural & Molecular Biology 21:449–455. Current Biology : CB 12:1240–1244. Molecular and Cellular Biology 19:8673–8685. Molecular and Cellular Biology 23:8323–8333. The Journal of Biological Chemistry 269:18414–18421. Trends in Biochemical Sciences 21:327–335. Nature Reviews Molecular Cell Biology 16:129–143. The Journal of Biological Chemistry 275:12374–12380. Molecular and Cellular Biology 6:3847–3853. Journal of Biological Chemistry 281:80–89. Molecular and Cellular Biology 35:2947–2964. Nature Structural & Molecular Biology 13:806–814. Current Protocols in Molecular Biology Chapter 7:Unit 7.11. Thank you for submitting your article "Requirements for preinitiation complex formation in vivo" for consideration by eLife. Your article has been reviewed by two peer reviewers, and the evaluation has been overseen by Michael Green as the Reviewing Editor and James Manley as the Senior Editor. The reviewers have opted to remain anonymous. This is a well-written manuscript with compelling rationale for this study. Experiments are nicely designed with appropriate controls. Data are of high quality with statistical analysis, using biological and technical replicates. Based on their data, the authors conclude here that all GTFs (general transcription factors) are required for PIC (pre-initiation complex) formation in vivo, and suggest that partial PIC is not stable in vivo, in contrast to previous in vitro studies. Further, they conclude that PIC is not stable when transcription elongation does not occur. They also conclude in this manuscript that TAFs (TBP-associated factors) contribute to transcription of most genes. These are important observations, and will have significant impact in the field of transcription. Please address all of the reviewers' comments below to the best of your ability. 1) TAFs contribute to transcription of most genes. This conclusion is solely based on deletion (anchor-away) of only TAF1, a specific component of TFIID. Inclusion of two other TFIID-specific TAFs would have significant impact on this conclusion. 2) PIC is not stable when transcription elongation does not occur. This conclusion is primarily based on the analyses of TBP and RNA polymerase II occupancies at the promoter following uracil depletion that impairs transcription elongation. Performing similar ChIP experiments following genetic inhibition of a transcription elongation factor and/or pharmacological inhibition of transcriptional elongation would have significant impact on this conclusion. 3) Partial PIC is not stable in vivo. This conclusion/suggestion is based on only TBP occupancy at the promoter in deletion backgrounds (anchor-away) of GTFs. Other components of the PIC are not analyzed here. Although TBP nucleates the PIC formation and other GTFs are not likely to be present at the promoter in the absence of TBP, it would be good to show that other components of PIC are not present at the promoter in the deletion backgrounds of various GTFs, thus supporting that partial PIC is not detectable by the ChIP assay. Alternatively and/or in addition, the authors may consider to pull down minimal core promoter following in vivo crosslinking and analyze what are the PIC components bound to the minimal core promoter with or without deletion of GTFs (or some cytological experiments using fluorescence microscopy may also help), though these experiments could be technically challenging. 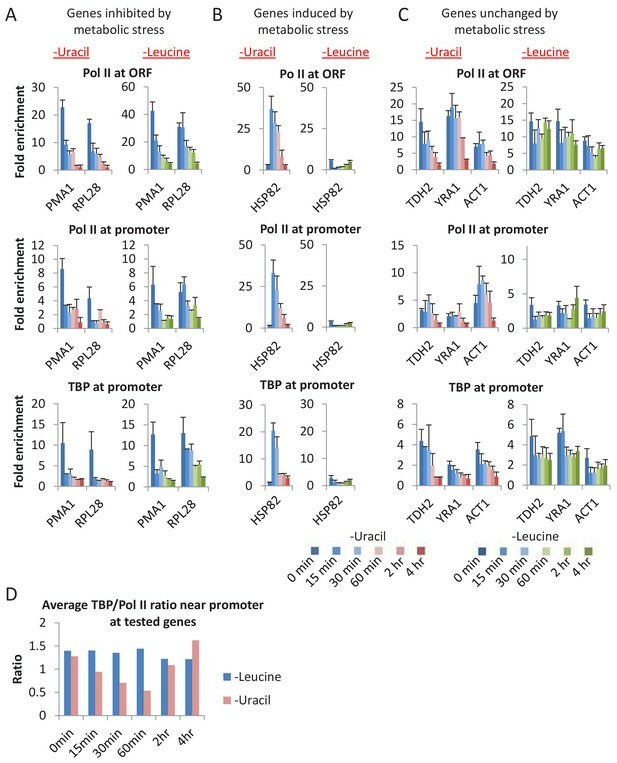 1) Previous in vivo studies from the Green laboratory have demonstrated that TFIIB and Mediator are dispensable for TBP recruitment at the TAF-dependent promoter, but are essential for TBP recruitment at the TAF-independent promoter (Li et al., 2000; Bhaumik et al., 2004). Mediator and TFIIB are required for transcription of both classes of genes (Li et al., 2000; Bhaumik et al., 2004). These studies indicate the existence of partial PIC at the promoter in vivo, as TBP remains bound to the TAF-dependent, but not TAF-independent, promoter in the TFIIB and Mediator mutants (Li et al., 2000; Bhaumik et al., 2004). In contrast, authors in this manuscript find that TFIIB depletion impairs TBP recruitment at all genes, and thus concludes that partial PIC is not stable in vivo. The authors need to take into consideration of these previous studies/facts (Li et al., 2000; Bhaumik et al., 2004) in their Results and Discussion in this manuscript. 2) Previous in vivo studies from the Struhl and Green laboratories (Mencía et al., 2002; Li et al., 2002) demonstrated that UAS or co-activator specificity of the activator predominantly contributes to the TAF-dependency or -independency, but not TATA-containing or lacking sequence. This was not apparent in this manuscript. The authors need to discuss this fact in the manuscript, especially in the last paragraph of the Discussion section. 3) The authors have written last but one paragraph in the Introduction section to make their case compelling for this study without discussing/mentioning several important facts (or publications) which are relevant here. For example, TAF-dependency or independency was published back to back in the same issue of Science by the Struhl and Green laboratories in 2000. Struhl publication is cited, but Green publication is not cited in the first sentence in this paragraph and several other places in this manuscript. In the second sentence of this paragraph, several important references from the Green and Struhl laboratories regarding TAF or SAGA dependency/independency are missing. These are: Mencía et al., 2002; Li et al., 2002; Bhaumik and Green 2001; and Bhaumik and Green 2002. The last sentence in this paragraph mentions that "However, this view has been challenged by experiments claiming that the two classes of promoters behave similarly upon TFIID depletion (Warfield et al., 2017)". However, the authors have not considered some important facts in line with this sentence. For example, previous studies demonstrated that NuA4 is required for TFIID recruitment at the ribosomal protein gene promoters (e.g., Reid et al., Molecular Cell, 2000; Uprety et al., 2012), and the absence of NuA4 impairs recruitment of TFIID to the ribosomal protein gene promoters (Uprety et al., 2015). Intriguingly, TBP (TAF-independent form of TBP) is recruited to the ribosomal protein gene promoters in the absence of NuA4 or TFIID, and such recruitment of TBP is mediated via SAGA (Uprety et al., 2015). Further, another recent study (Ferdoush et al., 2018) shows that SAGA is recruited to the PHO84 promoter for TFIID-independent transcription initiation in the YPD medium (or plus Pi). This gene can become TFIID-dependent in absence of Pi in the growth medium (Ferdoush et al., 2018). These studies indicate that the absence of TFIID can make a gene SAGA dependent and vice versa. These relevant studies may be mentioned here in this paragraph (or may be discussed later). 4) In the last paragraph of the Results section, the authors mention that "We also note that our analysis involves Pol II occupancy measurements at the region between +200 to +400 from the transcription start site, which avoids complications between transcriptional initiation and elongation, whereas the other study utilized the region between 0 and +100 (Warfield et al., 2017). Indeed, the distinction between "all TATA" and "all TFIID" genes is virtually eliminated when our Taf1-depletion data is analyzed between 0 and +100 (Figure 6—figure supplement 1B).". How does the change in position of Pol II analysis by about ~200 bp alter the conclusion? This needs to be appropriately discussed. How is the complication avoided between transcriptional initiation and elongation at the region between +200 and +400 from transcription start site? RNA polymerase II pausing could be an issue in this region. Analyzing additional TAFs by anchor-away has minimal value given the point of the paper. Many TAF-inactivation experiments indicating that TFIID-specific TAFs selectively affect transcription. Regarding TAFs, the major point of our paper is to invalidate the opposite claim of Warfield et al., 2017. We do this by measuring TAF:GTF occupancies upon depletion of TAF1 (not done previously for any TAF-depletion experiment) and by re-analyzing the Warfield et al. genome-wide experiment (i.e. by restricting the analysis to genes whose expression is above the background). We also emphasize and discuss an interesting difference (discovered but largely ignored by Warfield et al.) with respect to the importance of TFIID in YPD vs. SC medium. Nevertheless, while not doing any new experiments ourselves, we did address this comment by analyzing Warfield et al. data on two other TFIID-specific TAFs (TAF11 and TAF13). The results (Figure 7—figure supplement 2) clearly demonstrate that 3 different TFIID-specific TAFs behave selectively and similarly with respect to the TFIID-SAGA distinction. The suggestion of inhibiting elongation sounds good, but there is no known factor or drug that specifically inhibits elongation in yeast cells. More importantly, the point of the uracil experiment is to recreate the classic biochemical definition of the PIC (i.e. absence of NTPs) in vivoand assess its stability in vivo. There is no criticism of the experiment or the conclusions that arise. However, to address this suggestion, we now include an experiment done long ago in which we analyzed PIC and transcription levels in FACT-depleted cells. FACT is a histone chaperone that travels with elongating Pol II, is important for elongation through chromatin templates in vitro, and does not associate with promoters. Interestingly, as shown in new Figure 6, FACT depletion strongly reduces Pol II transcription genome-wide (already published by Pathak et al., 2018), and TFIIB occupancy at promoters. We recognize that the molecular basis of this observation is unknown, but we do think it is an interesting connection between elongation and PIC formation/stability worth reporting. We are not willing to do more experiments on FACT, so if our current Figure 6 is not acceptable to the reviewers, we will simply remove it. As mentioned above, the FACT experiment is not directly relevant for the uracil-depletion experiment, which is a key conclusion of the paper. The suggestion to look at other GTFs upon depletion of an individual GTF is unnecessary and would take a vast amount of work. First of all, our experiments already involve 2 GTFs, TBP and Pol II. Second, numerous biochemical experiments and high-resolution structural knowledge make it virtually impossible that any GTF or combination of GTFs can stably interact with the promoter in the absence of TBP. Moreover, to do this suggestion properly, we would have to do a vast number of genome-wide experiments in which we look at every GTF for every individual GTF depletion. Otherwise, one could always say that upon depletion of factor X, factor Y remains associated with a subset of promoters. The reviewer correctly notes that previous results that TBP can remain at TAF-dependent promoters upon thermal inactivation of TFIIB or Mediator (Med17 subunit) are in apparent conflict with our conclusion that partial PICs do not exist at appreciable levels in vivo. There are several possible explanations, not mutually exclusive, for this apparent discrepancy. First, the ts mutants used in the earlier experiments may not (and are unlikely to) completely inactivate TFIIB or Mediator. Because these experiments were done so long ago, ChIP was not done to assess the promoter occupancy of these factors upon thermal inactivation, and the transcriptional results relied on mRNA levels that are subject to mRNA stability issues. Furthermore, as these mRNA measurements were made only 45 minutes after the ts shift, considerable mRNA remained from before the shift (i.e. wasn’t degraded), thereby making it impossible to measure low/modest levels of transcription. In this regard, our more recent experiments using Pol II occupancy as an assay indicate that substantial transcription does occur in the Med17 ts mutant (and anchor-away allele), and transcription and TBP occupancy is more efficient at TAF-dependent promoters (Petrenko et al., 2017). Second, as the measurements in our current paper are made 1 hr after GTF depletion, it is possible that partial PICs might be metastable and exist at earlier time points (not so easy to distinguish true partial PICs from incomplete depletion). Thus, our conclusion that partial PICs do not exist at appreciable levels is correct. However, we now discuss these issues in the revised manuscript. We now mention the activator-specificity of TFIID recruitment to ribosomal protein promoters and cite the relevant papers. We note that this fact is largely irrelevant to the conclusions of our paper, which are concerned with whether TAFs are generally required or selectively important for transcription. We have cited the papers mentioned in this comment. We note that these comments are related to the role of NuA4 at ribosomal protein promoters and the role of SAGA, subjects that are only peripherally related to the experiments and conclusions here. The difference between Pol II occupancy measurements at +200- to +400 vs. those at 0 to +100 is very subtle. In both cases, the Warfield et al. analysis of “all genes” shows very little difference between TATA-containing and TATA-less promoters, whereas our analysis of the 500 most well-expressed genes (i.e. the ones where there is reliable data) shows considerable difference. We do not know why the measurements at these two different regions are subtly different and hence haven’t commented on this in the revised paper. Pol II pausing is not relevant here, because numerous genome-wide experiments indicate that pausing does not occur in yeast, unlike what occurs in many other eukaryotic organisms. We thank Steve Buratowski for antibodies against Taf1. This work was supported by a Croucher Foundation Fellowship and research grants MYRG2015-00186-FHS and MYRG2016-0-0211-FHS from the University of Macau to KHW and by a research grant to KS from the National Institutes of Health (GM30186). © 2019, Petrenko et al.